GREEN BAY — A 30-yard touchdown run by James Starks clinched victory for the Packers, 28-7, on a day when Coach Mike McCarthy took back the play-calling and the Packers leaned on their power running game. Sunday’s win over the Cowboys guarantees the Packers can do no worse than play for the NFC North title on Jan. 3 against the Vikings. The Packers, 9-4, took a one-game lead over the Vikings, who lost on Thursday in Arizona. The Packers defense was suffocating against the Cowboys’ passing attack. Star Cowboys receiver Dez Bryant was held to one catch for 9 yards. Eddie Lacy rushed for 124 yards on 24 carries, and Starks carried 11 times for 71 yards. 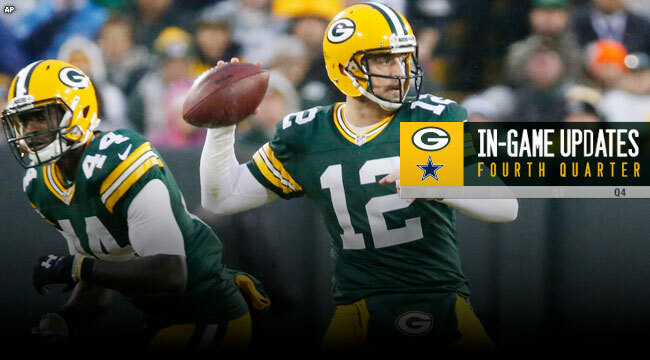 Quarterback Aaron Rodgers was workmanlike in completing 22 of 35 passes for 218 yards and two touchdowns.